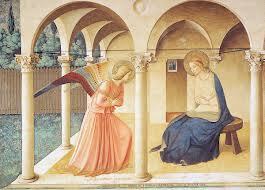 Fra Angelico is probably better known as an artist than as a holy man. Pope John Paul II beatified him in 1982. Fra Angelico is probably better known as an artist than as a holy man. He was already called “Beato” while he was still alive. Pope John Paul II gave this a new reality when he beatified him in 1982. Patrick Duffy tells his story. Born Guido di Pietro at Vicchio, 25 kms north-east of Florence, also the birth place of Giotto, in his childhood he was known as Guido da Vicchio or Guido di Pietro. 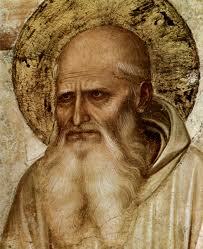 He may have been already a painter before he and his brother Benedetto joined the Dominicans at Fiesole. After his novitiate at Cortona he went to live at the Dominican convent at Fiesole. As a young friar, he worked at illuminating missals and manuscripts. He became known to his companions as Fra Giovanni da Fiesole, but later more popularly – even within his own lifetime in Italy – he was called Il Beato Angelico. In 1436 Fra Angelico was one of a number of the monks from Fiesole who moved into the newly-built monastery of San Marco in Florence. This not only put him in the centre of artistic activity but also engaged the patronage of the wealthy and powerful Cosimo de’ Medici, who often came there himself when he wanted to retreat from the world. According to his biographer Giorgio Vasari (1511-74), it was at Cosimo’s urging that Fra Angelico undertook the task of decorating the monastery, including the magnificent Chapter House fresco, the often-reproduced Annunciation, the Maesta with Saints Cosmas and Damian, Saint Mark and Saint John, Saint Lawrence and three Dominicans, Saint Dominic, Saint Thomas Aquinas and Saint Peter Martyr. 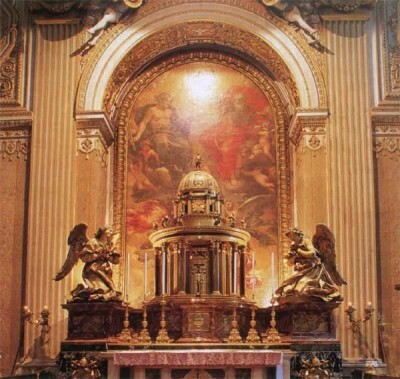 In 1445 Pope Eugenius IV (1431-47), who knew the artist’s work in Florence, summoned Angelico to Rome to paint the frescoes of the Chapel of the Holy Sacrament at St Peter’s, but this was destroyed a century later when Pope Paul III (Alessandro Farnese 1534-49) wanted to make room for the great staircase of the Vatican Palace. Vasari says that at this time Eugenius offered Fra Angelico the archbishopric of Florence, but that he refused it, recommending another friar for the position. In 1447 when the papal court moved to the comparative cool of Orvieto Fra Angelico worked with his pupil, Benozzo Gozzoli, on the vault of the chapel of the Madonna of St Brizio in the cathedral. In 1449 back at the Vatican, he designed the famous fresco scenes from the lives of St. Laurence and St. Stephen for the walls of the Chapel of Nicholas V. From 1449 until 1452, Fra Angelico was back at San Marco in Florence, where he was prior for three years. When singing my praise, do not say I was another Apelles. But say that, in the name of Christ, I gave all I had to the poor. Part of my work remains on earth and part is in heaven. The city that bore me, Giovanni, is the flower of Tuscany. 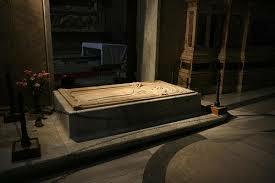 Tomb of fra Angelico O.P. Pope John Paul II beatified Fra Angelico on 3rd October 1982 and declared him patron saint of artists on 18th February 1984. Theologian Hans Urs von Balthasar said Angelico’s art embodies the motto of the Dominican Order contemplata aliis tradere, that is, “communicating to others the contemplated mysteries”. Another writer expressed a similar judgment: fece teologia dipingendo la bellezza, che mostrò la luce del Risorto nelle creature da lui redente: “he did theology by painting the beauty that shows the light of the Risen Christ in creatures”.